Media and Contents: Soft cover; 32 pages plus covers; glossy A4 format;1/72 and 1/48 scale plans; 50+ colour profiles (some with top and bottom views); 2 pages of Squadron service details; summary of models, decals and accessories. This is an Italian book with a very interesting concept. The text does not tell you how the C.202 was developed, or from what or why. Nor does it tell you how good it was compared to its contemporaries, or the difference between various production batches. 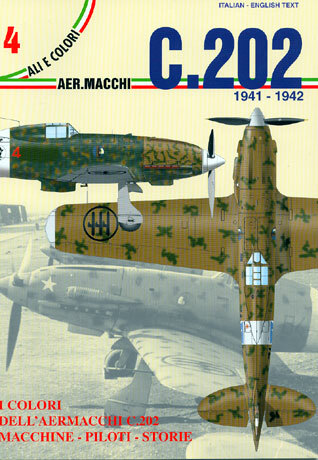 What it does give you is more than 50 side profiles, usually presented in large format, two to a page, with text in both English and Italian for each aircraft. If the profile represents a variation on camouflage or colours, a top or bottom view is also provided. The text advises the serial number and who flew the aircraft in addition to points of interest about camouflage, markings or operational use. Although it only covers two years of the C.202's use, with a set of Sky Decals and a host of Hasegawa or Italeri kits in 1/72 and/or 1/48 scales, someone who considers this aircraft to be their favorite will have a field day!